Download your free copy of the NorthStar VETS Pet Emergency Care Handbook. Let's face it: when you have a pet, the unexpected can happen at any time, day or night. The best way to handle it is to be prepared-so you can help your pet as calmly, quickly, and confidently as possible. Complete the form below to get your free copy of the NorthStar VETS Pet Emergency Care Handbook. Complete this form to get your free copy of the NorthStar VETS Pet Emergency Care Handbook. This 20-page booklet is your guide to knowing what to do in some of the most common pet emergencies from allergic reactions and cuts to seizures and vomiting. 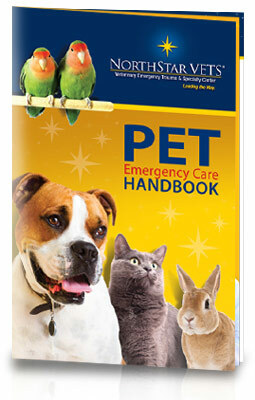 It also contains important information on how to be prepared for a pet emergency. After reading this book, don't hesitate to stop by NorthStar VETS or call us anytime at 609.259.8300 if you have questions.